Panoramio is a mobile application which allows the users to find pictures of interesting places with a radar to guide you to them, using GPS. Since the use of smart phones is gaining interest in people, panoramio was implemented as a smart phone application using Google’s Android operating system.The application starts by showing a custom map view using mobile maps. The user can pan and zoom the map to select a location. Once a search location has been selected the user taps on a location and the application starts loading all the thumbnails of pictures of all the interesting places taken in that area. By tapping on any thumbnail, information about the particular picture will be displayed. From here the user can view other photos taken by the same user or share the page. And even we can upload these new places. Show your favorite places to the world. Upload your photos to Panoramio. Upload your geolocated photos directly from the Gallery to your Panoramio account which, has following Features includes, Adds a new sharing option for any photo either taken by the built-in camera, or chosen from the gallery, Grab location from EXIF,Allow manual correction of the location. Panoramio is an application that enables digital photographers to geo-locate, store and organize their photographs–and to view those photographs in Google Earth and Google Maps.This application where users can upload and geo-locate photos of the world, explore the world through other people's photos, and join a community of other photography enthusiasts. Geo-positioned photos uploaded in Panoramio may be displayed in a Panoramio Group, Google Earth and Google Maps and other sites using the Panoramio API.Panoramio is different from other photo sharing sites because the photos illustrate places. As you browse Panoramio, notice that there aren't many photos of friends and family posing in front of places, or photos of interesting surfaces-- Panoramio's all about seeing the world. You can jump from one photo to the closest one, walking virtually around the place or watching the place from many different perspectives. Today there are many applications and web portals for using maps, one such example is ovi maps. Similarly there are portals to search pictures of interesting places and applications that uses radar to trace routes. But in applications or portals for maps, we can only view and explore the map. In applications or portals of image searching, additional information on location and option to share the information may not be given and in application like radar we can just trace route. But it would be convenient to the common man if all these features come in one single application or portal. Panoramio extended in order to view a map along with geo-tagging. It would be very convenient if the common man gets the information of all the interesting places at various locations on single portal with pictures and location information. If anyone wants to know about the interesting places at various locations and wants to visit those places then they can get that information through Panoramio. • It displays a custom map. • Displays a list or thumbnails of pictures of the most popular places within the search location. • Displays the information related to the selected picture. • Allows information sharing and bookmarking options. • Can also be used as a radar if the device supports GPS. The application starts by showing the Google map. As the application starts it shows the world map. On the map graphical user interfaces like zoom buttons are displayed. The user can pan and zoom this map and select a search area. This can be done as follows: the user can pan the map into the direction of the required ord desired location and then when the desired location is on the center of the screen then zoom option can be used to get a detailed view of the map. Panning and zooming is done until the desired location is obtained. After the desired location has been found, it is dragged to the center of the screen and then “Search Panoramio” is button is clicked to view thumbnails of photos of the popular places taken in that area. Thus, in this module the user can view a map, explore and search places. The google map which is used in the application by adding google API in our eclipse which is the integrated development environment used in the development of panoramio. Then the map API key(MD5 Fingerprint) is to be added to the application code to deploy it. This can be done by submitting the keystore value in the following link http://code.google.com/android/maps-apisignup.html. now when the application successfully runs and on opening shows the map. To this zoom buttons are added to the map using the widgets. Thus, in this module the user can view a map, explore and search places. When the “Search Panoramio” button is clicked the application starts downloading thumbnails of the most popular photos taken within the selected area. After panning and zooming the map until the desired location and is dragged to the center of the screen “Search Panoramio’ button is clicked and in a new thread an image list is displayed. The user can select any picture of interest and the pic gets displayed in a separate thread with the author’s information. From here when menu is selected four options are shown: Radar, Map, AuthorInfo, View on web. The user can select the “Radar” to trace the route, “Map” to view the location of the photo in the map and “View on web” to navigate to the panoramio site. If the user doesn’t use this menu and rather clicks on the selected image, then, again in a new thread an enlarged view of the selected image is. Thus, in this module the user views the image lists, that is, thumbnails, selects desired image, views image’s information and then bookmarks and shares their favourite image. The radar view can be selected once the user selects a picture from the image list. After selecting the picture the application shows the enlarged view of the picture with some additional information. From here when menu is clicked out of three other options, a radar option is found. If radar is selected then the application shows a radar view. But this is possible only if the device on which the application runs supports GPS and radar is installed. Otherwise “NO_RADAR” message is displayed. If the radar is installed and the device on which the application runs supports GPS then the application opens a radar view. In this the latitude values and longitude values are displayed. The gps locates the users current location and then finds and shows the route to selected picture’s location in the real world. Thus in this module the route from the users current location to the selected image’s location in the real world is displayed in radar view along with the location’s latitude and longitude value. AuthorInfo shows the information about the author of a particular photo or image. After an image is selected from the image list another thread opens with the image enlarged and with additional information. From here when menu is clicked along with three other options, a authorInfo button is displayed. When clicked on this the application navigates to the panoramio site and displays a list of other photos taken by the author and also the number of views for each photo. Other than displaying other photo’s taken by the author, the author’s profile is also displayed with the author’s profile pic, message, status, tags, groups and favorite photographs. From here the user has the options to send a private message to the author or add the photo as a favorite photo. Thus, in this module the user navigates to the author’s profile in the panoramio site to view detailed information of the author of a particular image. 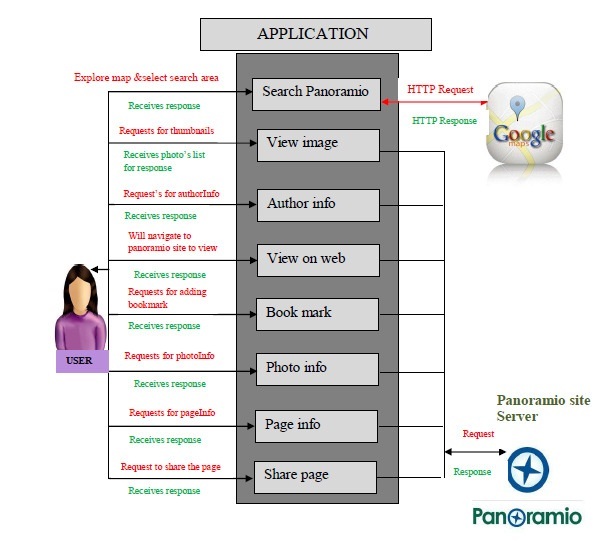 Web module allows the user to view the panoramio site. The user can navigate to the site by clicking the “view on web” button. A new thread opens showing the panoramio site. The user can view all photos in the panoramio site, view profiles of different authors/users, add a pic as favorite, share the pic with any other person, bookmark the page etc. the user can upload their photo from their gallery. 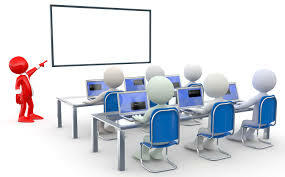 Thus, this module allows the user to use the panoramio site and allows them to do all the same things that they do in the application but, the difference is that here they are in an online mode and do all the operations directly through the site. Android SDK includes a comprehensive set of development tools. These include a debugger, libraries, a handset emulator (based on QEMU), documentation, sample code, and tutorials. Currently supported development platforms include x86-based computers running Linux (any modern desktop Linux Distribution), Mac OS X 10.4.8 or later, Windows XP or Vista. Requirements also include Java Development Kit, Apache Ant, and Python 2.2 or later. The officially supported integrated development environment (IDE) is Eclipse (3.2 or later) using the Android Development Tools (ADT) Plugin, though developers may use any text editor to edit Java and XML files then use command line tools to create, build and debug Android applications. 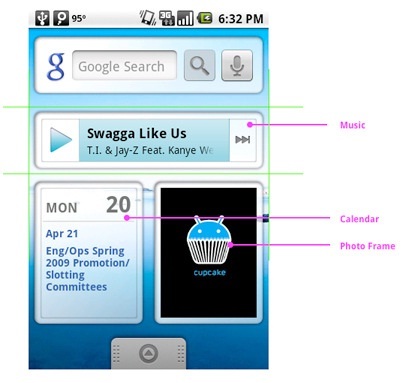 Widgets are a feature introduced in Android 1.5 and vastly improved in Android 3.0 and 3.1. A widget can display an application's most timely or otherwise relevant information at a glance, on a user's Home screen. The standard Android system image includes several widgets, including a widget for the Analog Clock, Music, and other applications. App Widgets are miniature application views that can be embedded in other applications (such as the Home screen) and receive periodic updates. These views are referred to as Widgets in the user interface, and you can publish one with an App Widget provider. An application component that is able to hold other App Widgets is called an App Widget host. Widgets are a new feature that application developers can use to promote a small sample of the most relevant dynamic data from their applications on the Home screen. We've designed widgets to fit within our Home screen grid framework, which means you and your designer can create a widget within a 4x1, 3x3, or 2x2 grid cell, depending on the space you need for an at-a-glance summary of information from your application. In future this paper is very useful to communicate with the people in their local languages who are in different countries. Voice processing feature can be added. • Support more than 20 different language pairs. If you like looking at pictures of places before you get to them, then this application is definitely worth looking into. It’s also really interesting to try out the radar feature and get an idea of how that will definitely become more widely used in future apps. Richardson, L. and S. Ruby, RESTful Web Services2007, Sebastopol, CA: O'Reilly Media, Inc. 446. Fielding, R., Architectural Styles and the Design of Network-based Software Architectures, in Information and Computer Science2000, University of California, Irvine: Irvine, CA. p. 162. Fielding, R., et al. Hypertext Transfer Protocol -- HTTP/1.1 (RFC 2616). 1999 5/20/2011]; Available from: http://tools.ietf.org/html/rfc2616. de la Beaujardiere, J., ed. OpenGIS Web Map Server Implementation Specification, Version 1.3.0. Vol. OGC® 06-042. 2006, Open Geospatial Consortium. 85.